I don't know who Lance Raymundo is and I don't know what he does. Never heard of him until I read about him online claiming that he talked to Jesus, saw the face of Jesus and Ignacia del Espiritu Santo on a comforter, and miraculously recovered from a gym accident. I suggest you go here and read the full article about his claims then come back here and read my comments on his unbelievable claims. Last March 20, Raymundo had part of his face crushed during a gym accident wherein a barbell fell on his face. Obviously, he was brought to the hospital to be fixed. And that's when the miracles started to happen, according to him. First, Raymundo claims to have seen a vision during his confinement. In a delirious state, Raymundo says he heard a voice talking to him, a voice which he describes as similar to the voice on the television show Big Brother. This is what the voice said: "You're only going to suffer for six days, but on the seventh day, I'm bringing you back, because I have a mission for you. I want you to continue what you're doing." Raymundo however did not elaborate as to what this "mission" is. This is very common among miracle claimers. They always say that they came back from the dead and survived accidents because God has a mission for them. But they usually don't elaborate on what their "missions" are. This is proof to another claim - God is mysterious - I guess. After encountering the vision, Raymundo says that he was skeptical but then the voice told him to sit up in bed to find an answer. Raymundo sat up in bed and that's when he saw what he claims to be the face of Jesus on his comforter. Raymundo's mother took a photo of the image and here's what it looked like. "Yung comforter ko, pag tingin ko, may mukha ni Jesus sa pagkakagusot ng comforter. It was his face, exactly." says Raymundo. All I can say is this is a classic example of pareidolia. This is a psychological phenomenon of seeing images and faces when they aren't there. Examples include seeing animals and faces in clouds and in walls stained by water. I challenge the reader to look at the photo above. Do you see Jesus in there? I don't. It's just a combination of light and shadows on a wrinkled comforter. So in conclusion, there's no miracle there. I could go outside right now, look at the clouds, and say that I saw a dozen faces of Jesus. If I tell you this, you would think me as crazy. I find it boggling that Raymundo used the term "exactly" in describing the image on the comforter. What's so exact about it? If you ask me, I can see a lot of other things on the comforter. Che Guevarra, a tree, a butterfly, a pig's snout, I could go on and on. Raymundo not only saw the face of Jesus on the comforter, he also claims to have seen the face of Ignacia del Espiritu Santo, a Filipino religious sister of the Roman Catholic Church who lived hundreds of years ago. 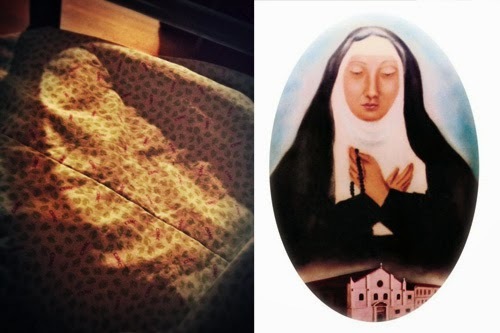 The photo on the left is what Raymundo saw, the one on the right is an artist's depiction of Ignacia del Espiritu Santo. Once again, Raymundo is seeing what he wants to see. This is nothing more than an example of pareidolia. It's just light and shadows. I don't see any resemblance at all. The main miracle that Raymundo claims is the one wherein he recovered from his tragic accident in less time than what the doctors said. The initial recommendation of the doctors is that operation can only be done after three weeks. But after Raymundo's vision wherein he talked to Jesus, the surgery was done in the first week which is two weeks earlier than the initial recommendation. This can be fully explained without resorting to miracle claims. The doctors did their job very well and this explains everything. Claiming that a miracle happened is an insult to the hard work that the doctors invested into Raymundo's treatment, surgery and recovery. It's worth pointing out that the three weeks which the doctors mentioned was just an initial recommendation. In medicine, initial assessments of doctors can change anytime based on various factors. So their initial assessment of three weeks can change anytime to two weeks or one week or even in days. This happens all the time. In conclusion, there is no miracle here. Doctors did their job, period. Another atrocious statement made by Raymundo is when he suggested that his supposed miracle can be the final miracle that Ignacia del Espiritu Santo needs to be turned into a saint by the Vatican. I don't believe in saints and the process of their making so this suggestion by Raymundo is not at all surprising to me. It is appalling nonetheless. Raymundo's claims of these miracles is yet another reason why it's important to question the workings of religion. Supposing that Raymundo's miracle claims are true, what does this say about the Christian God? Why would God spend so much time on Raymundo who is quite capable of taking care of himself while ignoring millions of other people suffering around the world. As an example, it's a fact that 20,000 children die everyday. That's about 15 every minute. Why doesn't God intervene in their case? They need the visions and the miracles more than Raymundo does. To end this article, here's a quote from Sam Harris (from a debate with William Lane Craig) to help drive the point: "Nine million children die every year before they reach the age of five. Picture an Asian tsunami of the sort we saw in 2004, that killed a quarter of a million people. One of those, every ten days, killing children only under five. Ok, that’s 20, 24,000 children a day, a thousand an hour, 17 or so a minute. That means before I can get to the end of this sentence, some few children, very likely, will have died in terror and agony. Ok,, think of, think of the parents of these children. Think of the fact that most of these men and women believe in God, and are praying at this moment for their children to be spared. And their prayers will not be answered. Ok, but according to Dr. Craig, this is all part of God’s plan. Any God who would allow children by the millions to suffer and die in this way, and their parents to grieve in this way, either can do nothing to help them, or doesn’t care to. He is therefore either impotent or evil."